Just found these pics and thought the forum might be interested to see them. The finish looks original so I'm curious if this guitar was put under the knife and then oversprayed, or if it left the factory (or perhaps Gene Moles' or Eddy Elliott's place?) like this. Odd. I knew I'd seen that plate-less bolt pattern somewhere else. I have no idea why this would be labeled a "Mark IV", though. 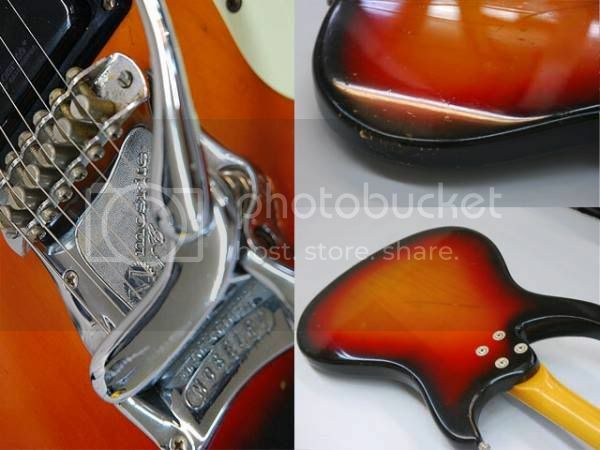 dorkrockrecords wrote: ...// The finish looks original so I'm curious if this guitar was put under the knife and then oversprayed, or if it left the factory (or perhaps Gene Moles' or Eddy Elliott's place?) like this. Odd. The straight neck pup & fingerboard AND odd pick guard contour (modified?) add to the difficulty in judging from here whether the body contour might have been a custom job or that it could have been modified, either by Semie himself or someone else (playing very high up the scale! ), after it had left the factory. That scooped out section at the longer horn doesn’t look very appealing -not to my sense of Mosrite aesthetics; makes me think it's a possible attempt at hiding severe damage. I’m also wondering how much of it’s contour will (in part) still match up with that of the original Ventures model. I don't know the year Semie started making models with non slanted neck pup and fingerboard… was it the 80's? This Sonic Blue Mosrite was reserected by Kip Scarlett. The work included the replacement of a section of wood in the lower cutaway. Kip used Sherwin Williams sand and sealer followed by ReRanch Sonic Blue nitrocellulose and ReRanch nitrocellulose clear coat. This was Kip's first restoration attempt and was done using only the aerosol sprays. He has detailed the progress of this project at Kip's Mosrite. Great job, Kip! creations back in the day. Second, you got to forget about that customized cut-a-way, some one did that later on in this guitars life, they must have wanted to solo in "A" real bad. This guitar could have very well been put to geither at the factory, don't see any serial numbers. Semie himself or Gene Moles could have put this guitar togeither after the factory closed. 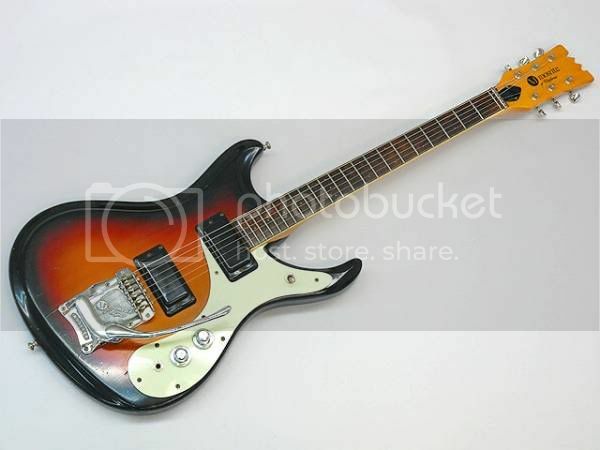 This guitar has all the right parts (except the tuners witch should be the Japanese diamond shaped ones) to be a late 1968, first 6 weeks 1969 Mark V.
Well there at the end Mosrite still had some orders but not any capital work with. Thay had on hand a big over run of D-100 Dobro necks, the D-100 is pretty much a Celebrity II with a Resonater, They took these D-100 necks shaved the heels and cut a "M" in the top, the tuners are straight across and the head is a bit stubbie, but what the heck, they really were very good necks. These necks were used on some of the last Mark Vs and the Celebrity III guitars and basses. Interesting and well executed variation on the V design. The guitar that DtM is referring to had a horrid and non-subtle cut, unlike this one. To me, the design would have looked much better if the top had been cut to match. It would have been more of a mini Mark I.
MWaldorf wrote: Interesting and well executed variation on the V design. The guitar that DtM is referring to had a horrid and non-subtle cut, unlike this one. To me, the design would have looked much better if the top had been cut to match. It would have been more of a mini Mark I. Thanks for filling in the details, Eddy. The serial number on the above guitar is B1687. 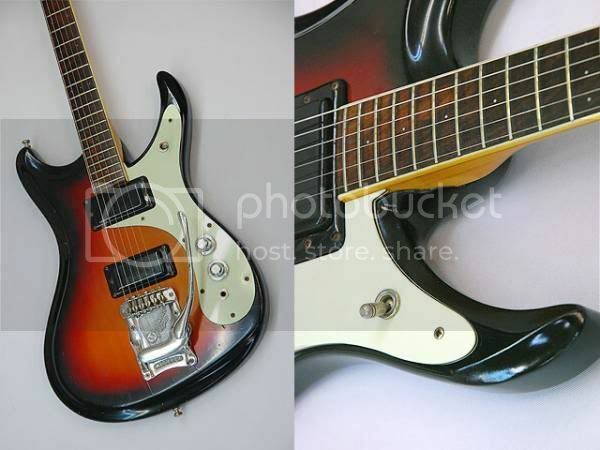 I've seen an awful lot of horrible mods in my time and remember that ReRanch guitar pre-restoration, but it seems odd that someone doing an amateur hackjob on a Mosrite would take the time to German carve the treble horn and overspray the burst. Whether you agree with it or not, makes me think someone knew what he was doing. The more I look at it, the more I think it's an aftermarket modification. The shape of the red band on the back of the guitar is the same as on the regular Mark V, in other words, it doesn't follow the contour of the deeper cut.